While the Silicon Valley seems to largely have turned a blind eye to any social network not named Facebook or Twitter, one country's citizens have flocked to alternative sites more than practically any other. 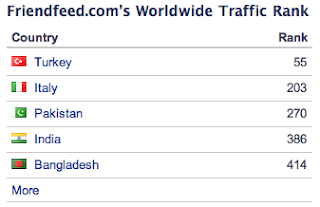 Turkey, well-known for being the #1 country driving traffic to the Facebook property FriendFeed, appears to be having a similar impact to the well-designed, if not fully embraced by the masses, Cliqset. 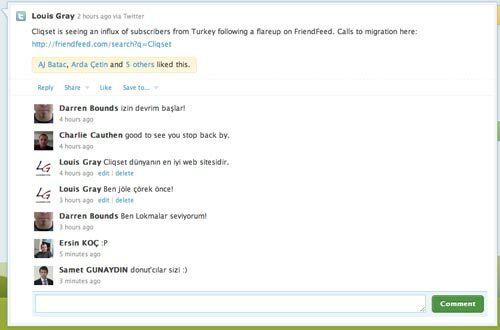 Partly due to the uncertainty around FriendFeed's domain, thanks to recent downtime, a year after the product was acquired, Turkish users of the network are seeking out alternatives, and have seemingly found Cliqset as the best alternative. Cliqset, which supports integration with more than 80 networks, has closely integrated with other sites, including Twitter and Google Buzz, to highlight mentions and migrate comments between networks, is now seeing the results of this migration, be it temporary and permanent, as the site's public feed (highlighted as Community) sports a great deal of Turkish posts and updates from the FriendFeed refugees. The sheer volume from the new arrivals, either testing the site or setting up their profiles, drowns out all other languages, amusingly. 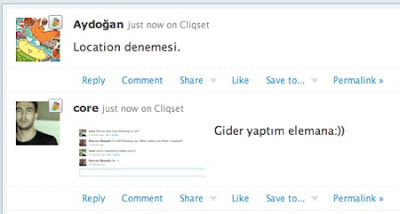 The Turkish invasion aside, Cliqset has quietly developed a fantastic tool for discussions, letting you easily discover your friends from other networks, search across the site for topics and tags, join groups, and see direct messages from Twitter from their centralized interface. In fact, the ties between Cliqset and other networks are so strong that you can see items you have favorited in Twitter, and should you follow a person on Cliqset who has registered their Twitter account, you may end up following them on that network as well. Earlier this month, TheNextWeb highlighted the tie-ins between Cliqset and Buzz, arguing the former was trying to save the latter, by offering an extremely clean interface to Google's network. 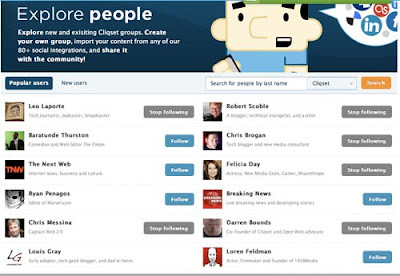 And whether you agree with the author's premise, his comment that "Both Buzz and Cliqset have a similar struggle: strong technology that is not quite matched with equivalent user activity," rings true in light of the more-discussed and more utilized alternatives, especially Facebook and Twitter. As somebody has always investigated edge case social networks, from FriendFeed to Strands, MergeLab, Socialmedian and others, the new generation, including Cliqset, Amplify and Google Buzz are innovators I am rooting for in the battle for attention and activity. While I don't speak a lick of Turkish outside of Google Translate, it's always good to see entire groups find community in a new place and have ties so strong that they can all migrate at once. 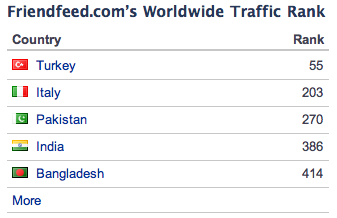 As for FriendFeed, I am sure the site will do just fine if their Turkish fans are now congregating in multiple places. You can find me on Cliqset at http://cliqset.com/louisgray. Your language choice is up to you.